I’m a big time Google fan but after seeing Ask.com’s ads, I decided to give them a try. So I set my homepage (which is set to Google.com) to Ask.com for an entire week. Here is what happened. So I get an email from Hotmail…errr I mean Windows Live Mail…wait I really mean Windows Live Hotmail. I’d know its name if Microsoft didn’t quit changing the name every few months. Why not just leave it named to Hotmail? The Microsoft branding team really has too much time on its hands. Windows Presentation Foundation instead of Avalon? Give me a break! 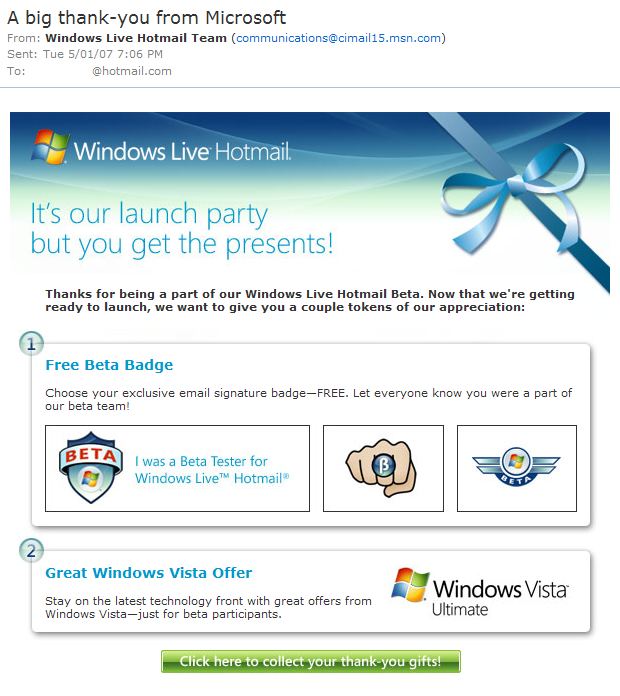 Anyway, so I get an email from the Windows Live Hotmail Team to thank me for beta testing Windows Live Hotmail. So what’s my reward for doing this? Three badges that I can download to proudly show off that I was a Windows Live Hotmail beta tester. What am I? A teenager? I would have been good with just a “thank you” letter. With .NET 2.0, Microsoft introduced Partial Classes which allows class definitions to span multiple files. The only use I had for it was to add a new method to the System.Math class. But that’s not possible. Why didn’t Microsoft make it so that we could augment core .NET classes with new methods like in Ruby? If you’re having trouble with listening to multiple sockets (or file descriptors) in C in UNIX, then I’m going to save you a lot of time by posting some sample code. I found my answer in a discussion dating back to 1999. Closing down the main website was a very difficult thing to do for me. I would really like to have left it there for people to surf. But I’m too busy to manage the website or update the content regularly. The main reasons I closed down the website were the following: spammers and hackers. If you ever manage a website that is not only made out of static web pages, then you will have to worry about hackers and script kiddies trying to hack your website to possibly deface it or even gain root access to the server. It is all too sad that some people have nothing better to do then try and hack vulnerable scripts. I introduced the shoutbox to the site back in 2004. I had no idea what I was getting myself into. Back then, I used to keep a very very close eye on my website’s logs. One day, I noticed something odd. It was someone trying to inject malicious code into the shoutbox script to try and gain access to the server. That was a really scary moment for me. I shut down the shoutbox and started doing research. Turns out the script I had been using had a very bad track record when it comes to security and exploits. I had to do something since the shoutbox proved to be a nice feature to the site. 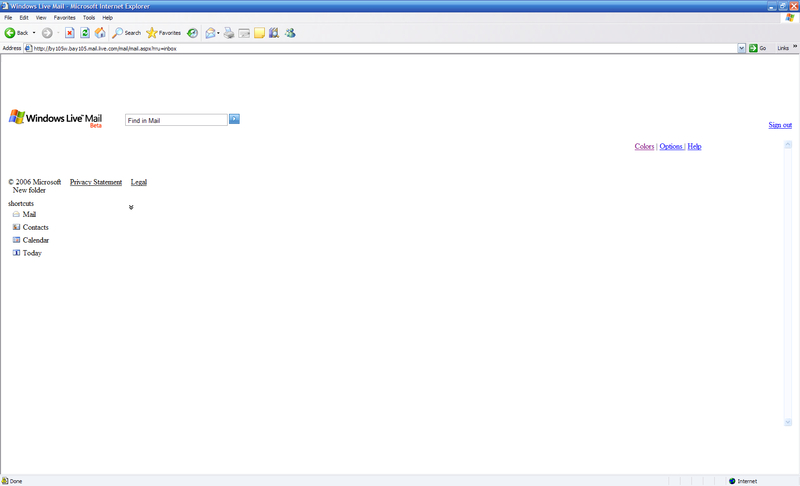 So I decided to rewrite my own shoutbox script. A week or so later, I was done. This experience was eye opening in the sense that if you are managing a website, you always have to keep look out for people trying to hack it. This can be very tiring. I hate them more than anything. The guestbook was basically hijacked by spammers and they would post all of their crappy links. I had to go in and regularly delete everything. It is a pain. The same happened with the shoutbox. It ended up becoming a spambox! So enough was enough and I had to shut down the website. I am thinking of something great to do with the website. A simple idea. But something that can benefit people in a lot of ways. And not just Haitians. I’m thinking. Give me some time or if you have an idea, post a comment. If I haven’t been blogging much it is because I have started an internship with a software company. I’d rather not say the name since it seems that blogging about your workplace and your employer can get you in trouble (it would all be positive though). So I’m a software developer and spend the entire day in front of a PC writing code and debugging software. And you know what? I love it! I like it more than writing software for myself for a variety of reasons. For one you sort of have deadlines. While you may not actually have deadlines, as it might be the case when you write most of the projects from scratch, realistically you can’t take forever to finish your project. So I am more motivated in that aspect. Furthermore, this is the first time where I’ve spent 40 hours a week writing software. It’s crazy how much more work you get done when it’s all you do during the day. It is also great that when you leave work, you can kinda shut off your brain from thinking about a project. While it’s hard for me to do that, I find myself thinking less about a project from work than I do about a personal project. While on the subject of personal projects, I have a new one. I can’t really talk about it since this one may actually have marketing potential and I wouldn’t want people stealing my idea, and I might have to patent the idea if it ever goes somewhere. But I’m very motivated. It involves a lot of hardware and software, so I’m teaming up with a friend who’s an electrician to guide me concerning the technical aspects of the project, while I handle the software aspect. The software won’t be trivial. I have two choices: build an operating system from scratch or use an existing operating system. Choice #1 is out of the question, writing an operating system is no joke, just thinking about it (memory management, process scheduling, …) makes my head hurt. So it’s pretty clear that the second choice is the only possibilty for now. Using Linux is pretty obvious too. It runs on almost anything and is great for embedded systems (examples of common products that run on Linux are the Toshiba Gigabeat and Linksys routers, though I think Linksys stopped using Linux now). Here’s a hint about the project: it goes in your home. For the past few months I’ve been working on a program which I’ve named eLibrary. Here are some details as to what it is and stuff. Why I Switched To Gmail from Hotmail? The first ever email account I owned was from Hotmail. I’m not exactly sure when I opened it, but it was around the year 2000. All I remember is that I received a lot of spam and my inbox was always full. The spam got so bad that I opened a new Hotmail account in hopes of running away from the spam. Within 2 hours of having created the new account, I received spam. I didn’t even have the time to give my new email to any of my friends and family. Furthermore, the 2 MB limit was a real pain. But I put up with all that crap until June 2004 when I managed to get a Gmail invite back when it was still hard to get one. Finally, I had more space available for my inbox that I could actually use. I switched to Gmail. I’ve been getting this all day and I’m unable to access my Windows Live Mail (Hotmail) account all day. Good thing I don’t get any critical email sent there. On Thursday I received a beta invitation to Windows Live Messenger 8.0 Beta (aka MSN Messenger 8.0 Beta). At first I was excited about trying it out but I uninstalled it after 3 days.